Over 3 hours of interactive video covering all major aspects of this music production software. 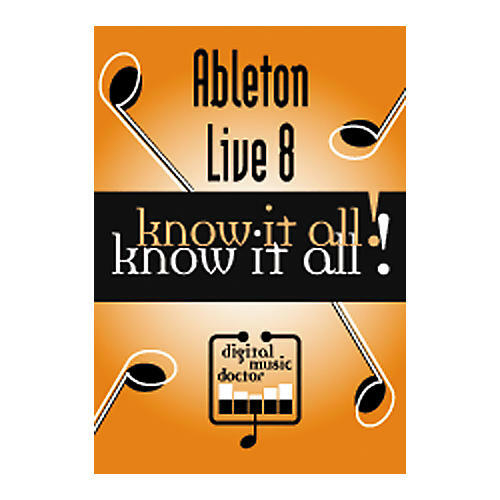 The Digital Music Doctor Ableton Live 8 Know It All! DVD contains offers a complete instructional guide to making music using the Ableton Live 8 Digital Audio Workstation. The DVD's Quick Start section presents a grand tour of Live 8's functions as well as a review of the new features in Live 8. The Audio Section contains in-depth tutorials on audio setup, recording, mixing, and mastering. The MIDI section features tutorials on virtual instruments, hardware synthesizers, MIDI editing, Rewire, and the Instrument, Effects, and Drum Racks. The Loops & Remix section presents a comprehensive discussion of using loops and the Audio Warp function. The Live Performance section of the DVD demonstrates Live's unique Session View as well as several DJ features. The Ableton Live 8 tutorials on Live 8 Know it All! are 3 hours and 17 minutes of Adobe Flash interactive videos in data DVD format that you play in your Windows XP or MAC OS X-equipped computers with DVD-ROM disc drive (NOTE: This Data DVD is like a CD-ROM and will not play in a video DVD player). For detailed descriptions of the subjects covered as well as the module timings for these courses see Digital Music Doctor Ableton Live 8, Ableton Live 7 and Ableton Live 6 course descriptions. Get a thorough and easy-to-understand Ableton Live 8 education. Order this DVD today! This is a data DVD. It will play in any computer that meets the system requirements, but not a video DVD player. It is not limited to any video DVD world region.